Do you need Fulvic Acid? Check out this blog from GlyMed Plus, our exclusive product supplier. GlyMed Plus is an innovator in skin care, and we are proud to represent its products. We have had a few questions about one of the newest innovative ingredients GlyMed Plus has started using, Fulvic Acid, and we wanted to answer some of the key questions here. This amazing ingredient will soon take the skincare world by storm. GlyMed Plus leads the industry with its use of Fulvic Acid in our skin care products. Fulvic Acid is a humic substance meaning that it is a major component of organic matter. Fulvic Acid is released as organic matter decomposes. This new ingredient is considered one of the most chemically active compounds in soil because it contains a variety of beneficial nutrients. It is anti-bacterial, anti-fungal, anti-viral, anti-inflammatory, and anti-allergic. Fulvic Acid is neither an AHA nor a BHA it is an electrolyte. Electrolytes are what allows our bodies to function properly. They help us to generate energy, think about when you drink a sports drink after you work out you feel better right? Electrolytes do the same thing for our skin; they enhance the availability of nutrients to make them more readily absorbable. This property restores each individual cell to a normal chemical balance. Electrolytes also allow our skin cells to function at a higher level just like sports drinks allow our bodies to function at a higher level and repair damage that has taken place. What does Fulvic Acid do in a skin treatment? Fulvic Acid acts as a delivery system, meaning it has the ability to make nutrients bioavailable to the skin allowing for deep penetration. This ingredient can literally transform minerals into molecules that are much more easily absorbed into the skin. Therefore, your cells are able to take in a higher amount of nutrients. The best part about this amazing ingredient is that everyone benefits from using it. It is incredibly reparative at the cellular level so those who suffer from any type of compromised skin and the inflammatory issue will especially benefit from the use of products with the ingredient Fulvic Acid. What benefits will come to my clients when using products formulated with Fulvic Acid? Skin concerns like dermatitis, psoriasis, eczema, seborrheic keratosis, pruritus, actinic keratosis, acne, and aging skin all have one thing in common and that is inflammation. When inflammation can be controlled then a lot of these uncomfortable and sometimes debilitating skin disorders can be controlled. It is believed that this innovative ingredient is so effective in treating the skin because of its anti-inflammatory and anti-bacterial properties. Fulvic Acid’s anti-bacterial effect is attributed to its capability to balance the pH levels in our body. When we have too much acid in the body, our immune system cannot function the way that it needs to. Our pH level should be just above neutral, at this level our immune system can locate and destroy bacterial overgrowth, which has been linked to acne breakouts. The topical application of Fulvic Acid reduces the production and impact of pro-inflammatory substances. Fulvic Acid is an extremely powerful antioxidant so it is very beneficial in preventing oxidation and inflammation, which are both main culprits of aging skin. As a powerful antioxidant, it will behave as an electron donor or acceptor depending upon the need for balance in skin cells. When the skin gets inflamed and damages the skin it alters collagen and elastin production causing the skin to age. The use of Fulvic Acid is essential to improve skin health and vitality. This is particularly important when treating aging skin. This ingredient helps to protect the cells. Does it increase cell turnover rate? No, it does not. This ingredient increases the function and performance of the cells but it does not have anything to do with cell turnover rare. Have no worries, it does not behave like an acid but it will enhance the abilities of an acid to work better within the skin. There are no known risks of using this ingredient. Our bodies actually need Fulvic Acid to function properly. Electrolytes, such as Fulvic Acid, are essential to the health of both the body and the skin. It is a natural organic substance that has so many benefits and really no known side effects. Is Fulvic Acid a common allergen? No, it is not, because it is an electrolyte the body will naturally accept it as something that is needed for health and proper function. How is Fulvic Acid related to enzyme production? Enzymes are a crucial part of cell metabolism, there has to be an enzyme reaction in order for a full metabolic activity to take place. It helps to stimulate enzymatic reactions in cells, helping to produce maximum stimulation of enzyme development. It is also said to have a coenzyme effect resulting in increased levels of enzyme and cell stimulation. The use of Fulvic Acid in skin care is essential to the skin and has unparalleled benefits for improving overall skin health. Fulvic Acid and its unique composition and capabilities bring cells to their highest level of performance, which is very important for the overall health of the skin. Fulvic Acid is the ingredient that everyone needs for optimum skin cell function.
. You can also send your questions about Fulvic Acid to info@glymedplus.com. Or call Janet Robbins, a master esthetician at Reflections Laser & Wellness Center 561-221-1462. Searching for Perfect Skin?? Just under your skin’s surface lies a spotless, lineless, flawless complexion—and doctors have found that a classic treatment is the fastest way there. Satin slip dresses slinked down the spring runways. Celebrities are wearing chokers on the red carpet. And here’s one more ’90s revival for you: the chemical peel. After being eclipsed in the early 2000s by new skin-resurfacing lasers, these classic treatments (like, ancient-Egypt classic) are back on top in dermatologists’ offices. More people are getting them now than in 1997 (when peels were the number-one cosmetic procedure in the country), according to the American Society for Aesthetic Plastic Surgery. “Turns out good old chemical peels can actually deliver certain skin benefits—like reversing melasma and breakouts—better than high-tech devices,” says Doris Day, a clinical associate professor of dermatology at NYU Langone Medical Center. By casting off dull surface cells, they improve fine lines, acne, discoloration, and more. And they do it for all skin types and colors—usually for a fraction of the cost. “The minute I switch on a laser, things get expensive,” says Vivian Bucay, a San Antonio dermatologist. A superficial fractional-laser treatment can run up to $1,000 a session—and you’ll probably need several. A medium-depth chemical peel may cost a third of that and “gives more impressive results in a single treatment,” says Bucay. As with most old-is-new-again ideas, today’s peels aren’t just total retreads. “When glycolic peels got really popular in the ’90s, they hut and left skin raw,” says Jeannette Graf, an assistant clinical professor of dermatology at Mount Sinai Hospital in New York City. But acid formulas have been refined, and so have the industries’ approach to using them. “Our goal now isn’t so much to cause visible peeling as it is to infuse the skin with ingredients that diminish lines, build collagen, and improve tone,” says Jennifer Linder, an assistant clinical professor of dermatology at the University of California, San Francisco, and the chief scientific officer for the clinical line PCA Skin. Still not sold? Here are five more reasons to book a peel—and help your skin make a radical comeback. 1.) Peels can make your skin—and skin-care products—work better. In minutes, acids lift away dead cells and trigger a chain reaction: “As that topmost layer is shed, signals are sent to the living cells below to multiply and move up, to increase collagen production, to make more hyaluronic acid—to act younger,” says David Bank, an assistant clinical professor of dermatology at Columbia University/Presbyterian Hospital in New York City. A thorough sloughing also offers one very immediate upshot: smoother skin that’s both more radiant and more receptive. “Your skin-care products perform better after a peel because there are no dead cells impeding their penetration,” says New York City dermatologist Neal Schultz, who averages at least 50 peels a week in his Park Avenue office. 2.) They’re low-risk, and you can go custom. There are chemical peels that are safe to use on every skin color without risk of hyperpigmentation (usually a worry with darker complexions). “We now know that using low percentages of multiple acids gives a better outcome with less irritation than a single acid at a higher strength,” Linder says. Doctors have plenty of premixed cocktails to choose from, like PCA Skin Sensi Peel, which mixes trichloroacetic acid (TCA) and lactic acid to rev up collagen synthesis deep down and dissolve the drab skin on top. But a lot of doctors also cook up their own recipes to address very specific concerns. For tenacious brown spots, Bucay adds a pinch of brightening vitamin C or a smidgen of bleaching hydroquinone to her acids of choice. And when treating those same spots on sensitive skin, she offsets the potent lighteners with soothing polyphenols. 4.) Nothing controls melasma better. There isn’t a permanent cure for the recurring sun-triggered dark patches brought on by hormonal surges (like those caused by pregnancy and the Pill), but chemical peels (paired with at-home bleaching creams, high-SPF sunscreen, and strict sun avoidance) offer the best fighting chance. Lasers may make lofty claims, yet “they’re essentially trying to treat a light- and heat-sensitive condition with light and heat,” says Cheryl Burgess, an assistant clinical professor of dermatology at Georgetown University in Washington, D.C. Even when a laser does eviscerate splotches initially, pigment often reappears weeks later, making lasers seem like a major investment for a short-term reprieve. 5.) A peel will let you (maybe) toss your undereye concealer. We don’t even like opening our eyes in the pool, so we’ll be the first to admit that acid near our eyeballs sounds dicey. Chemical Peels work beautifully and safely on the hereditary dark circles created by piled-up pigment. A series of treatments may be needed, but some people see a profound improvement after just one. When I was in my 20s, 30s and even my 40s, I was told I looked 10 years younger than my age on a regular basis. Now that I’m 50 something (said begrudgingly, although better than the alternative), this hasn’t been the case. So obviously I’m looking my age but still yearn for those compliments. For years, I’ve contemplated Botox (I hate needles, by the way) or a Facelift. And while I’ve been receiving ultrasonic facials at Reflections Laser & Wellness for about a year… and my skin feels softer and looks smoother, it just isn’t quite getting me the flattery that my vanity requires. And don’t get me wrong; I want healthier skin too. Recently, Janet (Robbins, my esthetician and owner of Reflections) convinced me to try Microneedling (did I tell you I hate needles). So I did, and oh wow. We’re on the way to avoiding that dreaded facelift. So what is Microneedling? 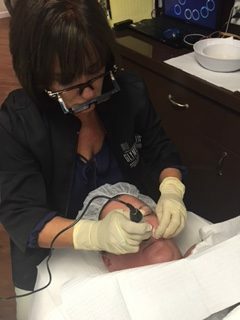 Also called Collagen Induction Therapy, Microneedling involves using fine needles to create tiny, invisible puncture wounds in the top layer of the skin. Yes, I said “needles.” Sounds awful, right? But it’s not; it actually felt like an intense massage. And what Microneedling does is stimulate the body’s natural wound healing process, which automatically turns over cells and increases collagen and elastin growth… ultimately helping to reverse and prevent signs of aging. But that’s not all. Microneedling can also eliminate acne scars, reverse sun damage, shrink your pores and make your skincare products absorb better so that they are more effective. Several hours after the process, I felt some intense tingling in my face, and then it felt like sandpaper for a few days because it was releasing the old collagen. Immediately after the process, I was able to go back to my work and normal activities and was told to stay out of the sun for a couple of days. Microneedling can also be combined with other minimally invasive procedures such as PRP (platelet rich plasma) therapy and chemical peels to achieve a more dramatic effect. It’s not inexpensive to take good care of your skin… and look younger… but to me, the benefits far outweigh the alternatives, including facelifts. (Did I mention I hate scalpels more than needles?) Oh, and don’t forget to use your sunscreen.